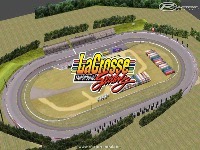 Lacrosse Fairgrounds Speedway is a 5/8ths mile short track oval located in West Salem, Wisconsin. This is an old N2002 Track that was originally made by Fred Anderson. (The original "ReadMe" is included). I have had a few request to convert this track to rFactor, so here you go. -There are only 21 pit stalls. Pit road is just to short for anymore. This track file is only 3.61 MB. There are currently no setups for Lacrosse Fairgrounds Speedway. Add a Setup. Track is "incomplete". Been there a couple times, there is a 1/4 mile track that resides off of the entrance of turn one, within the 5/8 mile track. D/L Worked fine for me. Thank's for the track, I had alot of laps on this one in N2003. zip dl works fine here. I think the problem is at your end latemodel2x? Getting same message on zip file d/l..can you use another service for your d/l?? I have added a zip file download for those having problems with the rar file.